Muscles of the hip joint are those muscles that cause movement in the hip. The muscles of the hip consist of four main groups. The adductors all originate on the pubis and insert on the medial, posterior surface of the femur, with the exception of the gracilis which inserts just below the medial condyle of the tibia. The iliacus and psoas major comprise the iliopsoas group. These six originate at or below the acetabulum of the ilium and insert on or near the greater trochanter of the femur. Rectus femoris and the sartorius can cause some movement in the hip joint but these muscles primarily move the knee, and not generally classified as muscles of the hip. The hamstring muscles, which originates mostly from the ischial tuberosity and insert on the tibia/fibula, also assist with hip extension. Fascia covering the gluteus medius. The fibers are directed obliquely downward and lateralward. 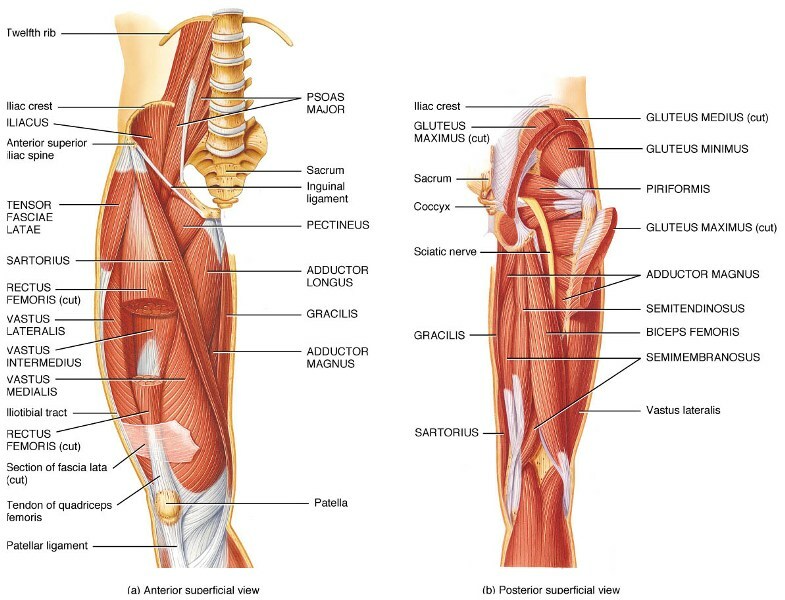 The gluteus maximus has two insertions – iliotibial band of the fascia lata and gluteal tuberosity between the vastus lateralis and Adductor Magnus. The gluteus medius extends from the ilium to the femur and acts as abductor and medial rotator of the hip. The gluteus minimus lies beneath the gluteus medius and is its companion in attachments and functions. Both muscles lie beneath the superficial and largest of the posterior thigh muscles, the gluteus maximus. The tensor fasciae latae is a tensor of the fascia lata, a fibrous sheath in the thigh. It arises from the anterior part of the outer lip of the iliac crest, anterior superior iliac spine, and part of the outer border of the notch below it and from the deep surface of the fascia lata. It is inserted between the two layers of the iliotibial band of the fascia lata about the junction of the middle and upper thirds of the thigh. It originates by a narrow origin from the outer surfaces of the superior and inferior rami of the pubis, between the gracilis and obturator externus. Its fibers, passing backward, lateralward, and downward, are inserted, by an aponeurosis, into the line leading from the lesser trochanter to the linea aspera and into the upper part of the linea aspera, immediately behind the pectineus and upper part of the adductor longus. The adductor longus lies ventrally on the adductor magnus, and near the femur, the adductor brevis is interposed between these two muscles. It is inserted into the middle third of the medial lip of the linea aspera. Anterior division (sometimes the posterior division) of the obturator nerve. The muscle consists of two parts. The ischiocondylar portion of the adductor magnus is considered a muscle of the posterior compartment of the thigh [due to its common embryonic origin, innervation, and action similar to the hamstring group of muscles] while the pubofemoral portion of the adductor magnus is considered a muscle of the medial compartment. Fibers which arise from the ramus of the pubis are short, horizontal in direction, and are inserted into the rough line of the femur leading from the greater trochanter to the linea aspera, medial to the gluteus maximus. Fibers from the ramus of the ischium are directed downward and laterally with different degrees of obliquity, to be inserted, by means of a broad aponeurosis, into the linea aspera. Fibers arising from the tuberosity of the ischium, form a thick fleshy mass which descends almost vertically and end about the lower third of the thigh in a rounded tendon. 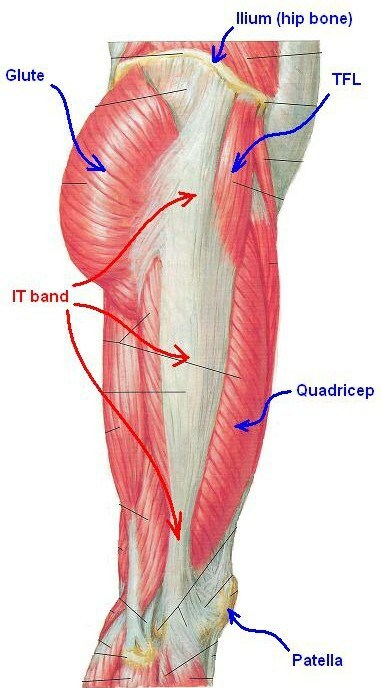 This tendon is inserted into the adductor tubercle on the medial condyle of the femur and is connected by a fibrous expansion to the line leading upward from the tubercle to the linea aspera. Adductor portion is innervated by the posterior division of the obturator nerve. Hamstring portion is innervated by the tibial nerve. The fibers pass downward, backward, and lateral, to be inserted into the pectineal line of the femur which leads from the lesser trochanter to the linea aspera. Femoral nerve (L2 and L3) + Accessory obturator nerve [in 20% people]. Gracilis is a thin flattened muscle on the medial side of the thigh. It is most superficial muscle on medial side of thigh thin and flattened, broad above, narrow and tapering below. Gracilis arises by a thin aponeurosis from the anterior margins of the lower half of the symphysis pubis and the upper half of the pubic arch. Muscle fibers run vertically downward, end in a rounded tendon which passes behind the medial condyle of the femur and curves around the medial condyle of the tibia where it flattens, and inserts into the upper part of the medial surface, below the condyle immediately above that of the semitendinosus muscle. Its upper edge is overlapped by the tendon of the sartorius muscle and together they form the pes anserinus. The pes anserinus is separated from the medial collateral ligament of the knee-joint by a bursa. A few of the fibers of the lower part of the tendon are prolonged into the deep fascia of the leg. The external obturator muscle is short external rotator muscle of hip joint. It is a flat, triangular muscle on the anterior wall of the pelvis. It arises from two-thirds of the outer surface of the obturator membrane, the inferior pubic ramus, and the ramus of the ischium. The fibers converge and pass posterolateral and upward, to form a tendon that runs across the back of the neck of the and is inserted into the trochanteric fossa of the femur. Obturator internus originates from the internal surface of obturator membrane and posterior bony margins of the obturator foramen. It inserts on the medial surface of greater trochanter of the femur, in common with superior and inferior gemelli. It is a short external rotator of hip joint. The inferior gemellus muscle arises from the ischial tuberosity and inserts on the medial surface of the greater trochanter of the femur and rotates the thigh outward. It is supplied by the nerve to Quadratus femoris. Both are external rotators of hip. Piriformis is one of six short external rotators [others being superior gemellus, inferior gemellus, obturator internus, obturator externus, and quadratus femoris muscles – together known as deep gluteals] and participates in the abduction of hip also. The piriformis muscle is found deep to the gluteus maximus and inferior to the gluteus minimus. Its name is because of its a pear-like shape. It takes origin along the anterior region of the sacrum. It extends laterally, passing through the greater sciatic foramen and crossing the hip joint to insert on the greater trochanter of the femur. The quadratus femoris is a flat, quadrilateral skeletal muscle located on the posterior side of the hip joint. It inserts into intertrochanteric crest. It is a strong external rotator and adductor of the thigh. The iliacus and psoas major muscles are closely related in structure and function and are often referred to as a single muscle, the iliopsoas. These muscles are distinct in the abdomen, but usually indistinguishable in the thigh. The psoas major originates along the lateral surfaces of the vertebral bodies of T12 and L1-L3 and their associated intervertebral discs. The iliacus originates in the iliac fossa of the pelvis. The psoas major unites with the iliacus at the level of the inguinal ligament and crosses the hip joint to insert on the lesser trochanter of the femur. The iliopsoas is involved in flexion and lateral rotation (supination) of the thigh. If the limb is fixed they involve in flexion of the trunk. The psoas major is innervated by direct branches of the anterior rami of the lumbar plexus ( L1-L3) while the iliacus is innervated by the femoral nerve (L2-L4). Iliopsoas are the powerful flexors of the thigh at the hip joint. The iliopsoas is important for standing, walking, and running. Sartorius, the longest muscle in the human body is a long, thin, band-like muscle. The sartorius muscle arises by tendinous fibers from the anterior superior iliac spine, runs obliquely across the upper and anterior part of the thigh in an inferomedial direction. It descends as far as the medial side of the knee, passes behind the medial condyle of the femur to end in a tendon which curves anteriorly to join the tendons of the gracilis and semitendinosus muscles to form the pes anserinus, and inserts into the medial surface of proximal tibia. The sartorius muscle functions as flexor, abductor and external rotator of the hip joint. At the knee joint the sartorius helps to flex the leg. Sitting cross-legged, making ankles rest on opposite knee are the movements where sartorius muscle is used. Turning the foot to look at the sole demonstrates all four actions of the sartorius. The rectus femoris constitutes quadriceps muscle along with vastus lateralis, vastus medialis, and vastus intermedius. The other, the posterior or reflected, from a groove above the rim of the acetabulum. The two heads unite and spread into an aponeurosis which is prolonged downward on the anterior surface of the muscle, and from this, the muscular fibers arise. The muscle gradually narrows into a flattened tendon and is inserted into the base of the patella. For the hip, the rectus femoris acts as flexor. It is also strong extensor of the knee as part of quadriceps muscle of knee. Semimembranosus, semitendinosus and biceps femoris are three hamstring muscles that originate above the hip joint and insert below the knee joint. Semitendinosus and semimembranosus extend the hip when the trunk is fixed and flex the knee. They also medially rotate the lower leg when the knee is bent. The long head of the biceps femoris extends the hip as when beginning to walk. Both short and long heads flex the knee and laterally rotates the lower leg when the knee is bent.